Dams of the Columbia River Basin. Click to view higher resolution and read legend. 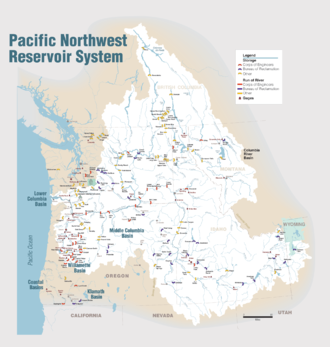 There are more than 60 dams in the Columbia River watershed in the United States and Canada. Tributaries of the Columbia River and their dammed tributaries, as well as the main stem itself, each have their own list below. The dams are listed in the order as they are found from source to terminus. Many of the dams in the Columbia River watershed were not created for the specific purposes of water storage or flood protection. Instead, the primary purpose of many of these dams is to produce hydroelectricity. As can be seen in the lists, these dams provide many tens of gigawatts of power. Major dam construction began in the early 20th century and picked up the pace after the Columbia River Treaty in the 1960s, by the mid 1980s all the big dams were finished. Including just the dams listed below, there are 60 dams in the watershed, with 14 on the Columbia, 20 on the Snake, seven on the Kootenay, seven on the Pend Oreille / Clark, two on the Flathead, eight on the Yakima, and two on the Owyhee. 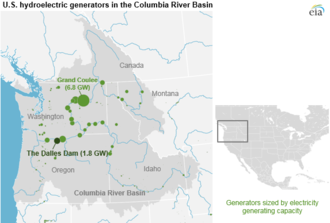 Averaging a major dam every 72 miles (116 km), the rivers in the Columbia watershed combine to generate over 36,000 megawatts of power, with the majority coming on the main stem. Grand Coulee Dam is the largest producer of hydroelectric power in the United States, generating 6,809 megawatts, over one-sixth of all power in the basin. In addition to providing ample power for the people of the Pacific Northwest, the reservoirs created by the dams have created numerous recreational opportunities, including fishing, boating, and windsurfing. Furthermore, by creating a constant flow and consistent depth along the river channel, the series of locks and dams have allowed for Lewiston, Idaho, to become the furthest inland seaport on the west coast of the United States. Despite the numerous benefits to humans that the dams have provided, a number of environmental consequences have manifested as a result of the dams, including a negative impact on salmonid populations of the basin. The organization of the following lists begins with the Columbia River dams and is followed by dams on its tributaries (in order of length) and their respective watersheds. Additionally, the table of contents below is indented to indicate tributary status of each river. Dams are listed in order from headwater (Columbia Lake, BC) to mouth (Pacific Ocean, OR/WA). Dams are listed in order from headwater (Two Oceans Plateau, WY) to mouth Columbia River, WA. Dams are listed in order from headwater (near Castle Mountain, Beaverfoot Range, BC) to mouth (Columbia River, BC). Dams are listed in order from headwater (Canadian Rockies) to mouth (Kootenay River, BC). Dams are listed in order from headwater (Upper Elk Lake) to mouth (Kootenay River, BC). Dams are listed in order from headwater (near Mount Dawson) to mouth (Kootenay River, BC). Dams are listed in order from headwater (Purcell Mountains) to mouth (Kootenay River, BC). Dams are listed in order from headwater (Little Lava Lake, OR) to mouth (Columbia River, WA/OR). Dams are listed in order from headwater (Keechelus Lake, WA) to mouth (Columbia River, WA). Dams are listed in order from headwaters (near Mount Daniel, WA) to mouth (Yakima River, WA). Dams are listed in order from headwaters (Three Queens, WA) to mouth (Yakima River, WA). Dams are listed in order from headwaters (near Crag Mountain, WA) to mouth (Naches River, WA). Dams are listed in order from headwaters (Goat Rocks, WA) to mouth (Naches River, WA). Dams are listed in order from headwaters (confluence of North Santiam and South Santiam rivers) to mouth (Willamette River, OR). Dams are listed in order from headwater (Timpanogas Lake, OR) to mouth (Willamette River, OR). Dams are listed in order from headwater (Clear Lake, OR) to mouth (Willamette River, OR). Dams are listed in order from headwater (Confluence of Big River and Garoutte Creek, OR) to mouth (Willamette River). Dams are listed in order from headwater (Lake Coeur d'Alene, ID) to mouth (Columbia River, WA). Dams are listed in order from headwater (Canadian Rockies) to mouth (Columbia River, BC). ^ Dam was initially completed in 1941; third power plant was begun in 1967 and completed in 1974. ^ The original dam was completed in 1911. In 1917, the dam was raised 17.5 feet (5.3 m) to increase storage. Later, safety concerns were addressed and the new, modified dam was completed in 1989. ^ Original dam was completed in 1927. Due to deterioration, a replacement dam was commissioned and completed in 1978. ^ a b c d e Information received in email exchange with representative from Idaho Power. ^ Constructed with two power plants - A & B. Upper Salmon A was completed in 1937, Upper Salmon B, located a mile upriver from A, was completed in 1947. ^ Initially constructed by Greater Shoshone and Twin Falls Water Power Company in 1910, bought by Idaho Power in 1916 and updated in 1949. ^ Dam and units one to four completed in 1959, unit five completed in 1980. ^ Dam and first three powerhouses were completed in 1975. Three further powerhouses, as well as modifications to Lewiston's water intake, were completed in 1987. ^ Dam was initially completed in 1961 with three generators online. Powerhouse units four through six were later added and online in 1976. ^ The first Wild Horse Dam was constructed in 1937. After the aggregate was found to be of poor quality, a new concrete, thin arch dam was completed in 1969, doubling the size of the reservoir. ^ Power plant located at Owyhee Dam. ^ Power plant located along the Owyhee Tunnel No. 1. ^ Power plant located along the Mitchell Butte Lateral. ^ Kootenay Canal Generating Station is located at the end of a canal created by the Corra Linn Dam. ^ a b Original dam constructed in 1944 created 140 MW; expansion completed in 2007 added 120 MW. ^ Although these rivers are not one, for the simplification of this list they will be listed together, as they are only separated by Lake Pend Oreille. ^ This dam is made up of four sections with the highest being 7001335280000000000♠110 ft (34 m) and the other three lower sections being 7001161544000000000♠53 ft (16 m), 7001115824000000000♠38 ft (12 m), and 7001164592000000000♠54 ft (16 m). ^ All forks of Flathead River are treated as being on main stem, as there is only one dam on any of the forks. ^ Originally constructed in 1894, upgraded to concrete structure in 1933, with significant upgrades in the 1980s. ^ Beginning in 1892, dams were constructed at the mouth of Lake Chelan. After two failures, a more robust dam was constructed in 1903, providing electricity to Chelan. The current dam was completed in 1927. ^ U.S. Energy Information Administration (2014-11-14). "Renewable Energy Explained". Retrieved 2015-01-03. ^ Idaho Transportation Department (2005). "Inside the Idaho Transportation Department" (PDF). Retrieved 2015-01-03. ^ U.S. Department of Energy (1994). "A Review of the Effects of Dams on the Columbia River Estuarine Environment, with Special Reference to Salmonids" (PDF). Retrieved 2015-01-03. ^ Center for the Columbia River History. "Dams of the Columbia Basin & Their Effects on the Native Fishery". Archived from the original on 2015-09-15. Retrieved 2015-01-03. ^ a b BC Hydro (2014). "Columbia Region". Retrieved 2015-01-03. ^ Ministry of Energy, Mines and Natural Gas (2012-12-05). "A Review of the Range of Impacts and Benefits of the Columbia River Treaty on Basin Communities, the Region and the Province" (PDF). Retrieved 2015-01-03. ^ BC Hydro (2014). "Hugh Keenleyside Dam". Retrieved 2015-01-03. ^ a b c d e f g h i j Columbia Basin Trust (2012). "Columbia River Basin: Dams and Hydroelectricity" (PDF). Retrieved 2015-01-03. ^ a b c United States Bureau of Reclamation (2012). "Grand Coulee Dam and Statistics" (PDF). Archived from the original (PDF) on 2008-05-09. Retrieved 2015-01-03. ^ Fundamentals of Renewable Energy. "Chief Joseph Dam Hydroelectric Power Plant" (PDF). Archived from the original (PDF) on 2015-01-05. Retrieved 2015-01-03. ^ Columbia Basin Research. "Chief Joseph Dam - Hydroelectric Project Information". Retrieved 2015-01-03. ^ Federal Energy Regulatory Commission. "Order Issuing New License" (PDF). Retrieved 2016-03-18. ^ Columbia Basin Research. "Wells Dam - Hydroelectric Project Information". Retrieved 2015-01-03. ^ Federal Energy Regulatory Commission. "Order on Offer of Settlement and Issuing New License" (PDF). Retrieved 2016-03-18. ^ Columbia Basin Research. "Rocky Reach Dam - Hydroelectric Project Information". Retrieved 2015-01-03. ^ Federal Energy Regulatory Commission. "Order on Remand Issuing License and Approving Settlement Agreement" (PDF). Retrieved 2016-03-18. ^ Columbia Basin Research. "Rock Island Dam - Hydroelectric Project Information". Retrieved 2015-01-03. ^ a b The Northwest Power and Conservation Council (2013-11-13). "A Guide to Major Hydropower Dams of the Columbia River Basin". Retrieved 2015-01-06. ^ a b Grant PUD (2015). "WANAPUM DAM". Retrieved 2015-01-03. ^ Grant PUD (2015). "PRIEST RAPIDS DAM". Retrieved 2015-01-03. ^ Columbia Basin Research. "Priest Rapids Dam - Hydroelectric Project Information". Retrieved 2015-01-03. ^ United States Army Corps of Engineers. "McNary Lock and Dam". Retrieved 2015-01-03. ^ Columbia Basin Research. "McNary Dam - Hydroelectric Project Information". Retrieved 2015-01-03. ^ Columbia Basin Research. "John Day Dam - Hydroelectric Project Information". Retrieved 2015-01-03. ^ Columbia Basin Research. "The Dalles Dam - Hydroelectric Project Information". Retrieved 2015-01-03. ^ United States Corps of Engineers. "The Bonneville Lock and Dam Fact Sheet" (PDF). Retrieved 2015-01-03. ^ Columbia Basin Research. "Bonneville Dam - Hydroelectric Project Information". Retrieved 2015-01-03. ^ a b United States Bureau of Reclamation (2012-10-29). "Jackson Lake Dam". Retrieved 2015-01-03. ^ a b United States Bureau of Reclamation (2012-10-25). "Palisades Dam". Retrieved 2015-01-03. ^ Idaho Falls Power. "Idaho Falls Power Hydroelectric Project". Archived from the original on 2015-01-01. Retrieved 2015-01-03. ^ a b United States Bureau of Reclamation (2012-10-25). "American Falls Dam". Retrieved 2015-01-03. ^ a b c d e United States Bureau of Reclamation (2013-01-03). "Minidoka Project". Archived from the original on 2012-09-22. Retrieved 2016-03-08. ^ a b c United States Bureau of Reclamation (2012-11-26). "Minidoka Dam". Retrieved 2015-01-03. ^ Idaho State Historical Society Reference Series (1985). "Milner Dam" (PDF). Retrieved 2015-01-03. ^ a b c d e f g Idaho Power. "Decision Support Systems" (PDF). Retrieved 2015-01-03. ^ Idaho Power. "Hydroelectric Plants". Retrieved 2015-01-05. ^ "The History of Shoshone Falls Dam". 2011-07-10. Retrieved 2015-01-05. ^ a b Idaho Power (August 2005). "Initial Consultation Document: Shoshone Falls Hydroelectric Project" (PDF). Retrieved 2015-01-05. ^ a b Hydropower Reform Coalition & River Management Society (April 2013). "Hydropower Project Summary - Mid-Snake River, Idaho" (PDF). Retrieved 2015-01-05. ^ a b Idaho Power. "C. J. Strike Project". Retrieved 2015-01-03. ^ Idaho Power. "Swan Falls Power Plant" (PDF). Retrieved 2016-03-13. ^ Idaho Power. "Swan Falls". Retrieved 2015-01-03. ^ Idaho Power. "Decision Support Systems" (PDF). Retrieved 2015-01-03. ^ a b Columbia Basin Research. "Brownlee Dam - Hydroelectric Project Information". Retrieved 2015-01-03. ^ Columbia Basin Research. "Oxbow Dam - Hydroelectric Project Information". Retrieved 2015-01-03. ^ Columbia Basin Research. "Hells Canyon Dam - Hydroelectric Project Information". Retrieved 2015-01-03. ^ United States Army Corps of Engineers. "Lower Granite Lock and Dam". Retrieved 2015-01-03. ^ Columbia Basin Research. "Lower Granite Dam - Hydroelectric Project Information". Retrieved 2015-01-03. ^ United States Corps of Engineers. "Lower Granite Lock and Dam". Retrieved 2015-01-03. ^ United States Army Corps of Engineers. "Little Goose Lock and Dam". Retrieved 2015-01-03. ^ Columbia Basin Research. "Little Goose Dam - Hydroelectric Project Information". Retrieved 2015-01-03. ^ United States Corps of Engineers. "Lower Monumental Lock and Dam". Retrieved 2015-01-03. ^ Columbia Basin Research. "Lower Monumental Dam - Hydroelectric Project Information". Retrieved 2015-01-03. ^ a b United States Corps of Engineers. "Ice Harbor Lock and Dam". Retrieved 2015-01-03. ^ Columbia Basin Research. "Ice Harbor Dam - Hydroelectric Project Information". Retrieved 2015-01-03. ^ National Performance of Dams Program (2016). "Goose Creek Dam". Retrieved 2016-03-10. ^ National Performance of Dams Program (2016). "Brundage Dam". Retrieved 2016-03-10. ^ National Performance of Dams Program (2016). "Wild Horse". Retrieved 2016-03-12. ^ State of Nevada (2011-08-26). "State of Nevada – Certificate of Appropriation of Water" (PDF). Retrieved 2015-01-11. ^ U.S. Department of the Interior (1973). "Bathymetric Reconnaissance of Wildhorse Reservoir, Elko County, Nevada" (PDF). Retrieved 2015-01-11. ^ Department of the Interior - U.S. Fish and Wildlife Service (2002-05-28). "Report to the Office of Management and Budget on the U.S. Fish and Wildlife Service's Fisheries Mitigation Program" (PDF). Retrieved 2015-01-11. ^ National Performance of Dams Program (2016). "Antelope Reservoir (Malheur)". Retrieved 2016-03-12. ^ a b c d e United States Bureau of Reclamation (2013-01-03). "Owyhee Project". Retrieved 2016-03-12. ^ National Performance of Dams Program (2016). "Wilson Res". Retrieved 2016-03-10. ^ National Performance of Dams Program (2016). "Bull Run Dam". Retrieved 2016-03-10. ^ National Performance of Dams Program (2016). "Dry Creek Dam". Retrieved 2016-03-10. ^ National Performance of Dams Program (2016). "Rawhide Res". Retrieved 2016-03-10. ^ National Performance of Dams Program (2016). "Sheep Creek Reservoir". Retrieved 2016-03-10. ^ National Performance of Dams Program (2016). "Chimney Creek Dam". Retrieved 2016-03-10. ^ National Performance of Dams Program (2016). "Warm Springs". Retrieved 2016-03-12. ^ a b c d e United States Bureau of Reclamation (2012-06-01). "Vale Project". Retrieved 2016-03-12. ^ Oregon Fish and Wildlife Commission (2014-01-01). "Agreement between Warmsprings Irrigation District and the Oregon Fish and Wildlife Commission Concerning Funding of a Fish Entrainment Mitigation Program in Lieu of Fish Screens for the Warmsprings Dam Hydroelectric Project, FERC Number 13570 (Agreement)" (PDF). Retrieved 2016-03-12. ^ Federal Energy Regulatory Commission (2009-05-02). "Agency Valley Hydro, LLC; Notice of Application Accepted for Filing and Soliciting Motions To Intervene, Protests, and Comments" (PDF). Retrieved 2016-03-12. ^ National Performance of Dams Program (2016). "Bully Creek". Retrieved 2016-03-12. ^ National Performance of Dams Program (2016). "Willow Creek Reservoir #3 (Malheur)". Retrieved 2016-03-12. ^ National Performance of Dams Program (2016). "Wallowa Lake Reservoir". Retrieved 2016-03-12. ^ National Performance of Dams Program (2016). "Mason". Retrieved 2016-03-12. ^ a b United States Bureau of Reclamation (2012-06-01). "Baker Project". Retrieved 2016-03-12. ^ Federal Energy Regulatory Commission (2014-08-11). "Notice of Application Accepted for Filing, Soliciting Motions to Intervene and Protests, Ready for Environmental Analysis, and Soliciting Comments, Recommendations, Preliminary Terms and Conditions, and Preliminary Fishway Prescriptions". Retrieved 2016-03-12. ^ National Performance of Dams Program (2016). "Thief Valley". Retrieved 2016-03-12. ^ United States Bureau of Land Management (2014-03-19). "Blackfoot Reservoir Campground". Retrieved 2016-03-10. ^ a b c National Performance of Dams Program (2016). "Blackfoot". Retrieved 2016-03-10. ^ a b c d National Performance of Dams Program (2016). "Henry's Lake". Retrieved 2016-03-08. ^ a b c National Performance of Dams Program (2016). "Island Park". Retrieved 2016-03-08. ^ Northwest Power Services, Inc. (April 2006). "Buffalo River Hydroelectric Project: Report Supporting Endorsement as a Low-Impact Hydroelectric Power Facility" (PDF). Retrieved 2016-03-09. ^ Low Impacy Hydropower Institute (2015-11-08). "LIHI Certificate #61 – Ashton Hydroelectric Project, Idaho". Retrieved 2016-03-09. ^ a b National Performance of Dams Program (2015). "Ashton". Retrieved 2016-03-09. ^ National Performance of Dams Program (2015). "Crosscut Diversion". Retrieved 2016-03-09. ^ Sunrise Engineering (May 2011). "Chester Hydroelectric Project". Retrieved 2016-03-09. ^ a b National Performance of Dams Program (2016). "Grassy Lake". Retrieved 2016-03-10. ^ National Performance of Dams Program (2016). "Portneuf". Retrieved 2016-03-10. ^ National Performance of Dams Program (2016). "Salmon Falls". Archived from the original on 2016-03-11. Retrieved 2016-03-10. ^ National Performance of Dams Program (2016). "Cedar Creek". Retrieved 2016-03-10. ^ National Performance of Dams Program (2016). "Arrowrock". Retrieved 2016-03-10. ^ a b c d e f United States Bureau of Reclamation (2013-01-03). "Boise Project". Retrieved 2016-03-12. ^ National Performance of Dams Program (2016). "Lucky Peak". Retrieved 2016-03-10. ^ United States Army Corps of Engineers (2012). "Lucky Peak Dam and Lake". Retrieved 2016-03-12. ^ National Performance of Dams Program (2016). "Boise River Diversion". Retrieved 2016-03-10. ^ National Performance of Dams Program (2016). "Barber". Retrieved 2016-03-10. ^ Enel Green Power (2015). "Barber Dam Hydroelectric Project". Archived from the original on 2016-03-04. Retrieved 2016-03-12. ^ National Performance of Dams Program (2016). "Anderson Ranch". Retrieved 2016-03-10. ^ National Performance of Dams Program (2016). "Little Camas". Retrieved 2016-03-10. ^ National Performance of Dams Program (2016). "Oakley". Retrieved 2016-03-11. ^ National Performance of Dams Program (2016). "Lost Valley". Retrieved 2016-03-11. ^ National Performance of Dams Program (2016). "C Ben Ross". Retrieved 2016-03-11. ^ National Performance of Dams Program (2016). "Crane Creek". Retrieved 2016-03-11. ^ National Performance of Dams Program (2016). "Mann Creek". Retrieved 2016-03-11. ^ United States Bureau of Reclamation (2013-01-03). "Mann Creek Project". Retrieved 2016-03-12. ^ National Performance of Dams Program (2016). "Unity". Retrieved 2016-03-12. ^ United States Bureau of Reclamation (2012-06-01). "Burnt River Project". Retrieved 2016-03-12. ^ United States Bureau of Reclamation (2012-06-01). "Bureau of Reclamation Renewable Energy Update" (PDF). Retrieved 2016-03-12. ^ United States Bureau of Reclamation (2012-07-12). "Ririe Project". Retrieved 2016-03-10. ^ a b c National Performance of Dams Program (2016). "Ririe". Retrieved 2016-03-10. ^ National Performance of Dams Program (2016). "Black Canyon Diversion". Retrieved 2016-03-10. ^ National Performance of Dams Program (2016). "Upper Payette Lake". Retrieved 2016-03-10. ^ National Performance of Dams Program (2016). "Granite Lake Dam". Retrieved 2016-03-10. ^ National Performance of Dams Program (2016). "Payette Lake". Retrieved 2016-03-10. ^ National Performance of Dams Program (2016). "Little Payette Lake". Retrieved 2016-03-10. ^ National Performance of Dams Program (2016). "Cascade". Retrieved 2016-03-10. ^ National Performance of Dams Program (2016). "Sage Hen". Retrieved 2016-03-10. ^ National Performance of Dams Program (2016). "Paddock Valley". Archived from the original on 2016-03-13. Retrieved 2016-03-10. ^ National Performance of Dams Program (2016). "Deadwood". Retrieved 2016-03-10. ^ "Dworshak Dam and Reservoir". U.S. Army Corps of Engineers. U.S. Army Corps of Engineers. Retrieved 9 September 2015. ^ a b c d National Performance of Dams Program (2016). "Magic". Archived from the original on 2016-03-12. Retrieved 2016-03-11. ^ Foundation for Water and Energy Education (2016). "Magic Dam: Big Wood River, ID". Retrieved 2016-03-11. ^ National Performance of Dams Program (2016). "Mormon (Twin Lakes)". Retrieved 2016-03-12. ^ a b c d National Performance of Dams Program (2016). "Little Wood". Retrieved 2016-03-11. ^ United States Bureau of Reclamation (2012-07-26). "Little Wood River Project". Retrieved 2016-03-11. ^ a b c d National Performance of Dams Program (2016). "Fish Creek". Retrieved 2016-03-11. ^ United States Army Corps of Engineers (2013-05-24). "Libby Dam Visitor Center hours and tours reduced for Summer 2013". Retrieved 2015-01-06. ^ United States Army Corps of Engineers. "Libby Dam and Lake Koocanusa". Retrieved 2015-01-06. ^ USACE & Bonneville Power Administration (February 2009). "Columbia River Treaty: History and 2014/2024 Review" (PDF). Retrieved 2015-01-06. ^ a b c FortisBC. "Electricity facilities & operations". Retrieved 2015-01-06. ^ Touchstone Nelson: Museum of Art and History (2007). "Upper Bonnington Dam". Retrieved 2015-01-06. ^ Touchstone Nelson: Museum of Art and History (2007). "Lower Bonnington Dam". Retrieved 2015-01-06. ^ Touchstones Nelson:Museum of Art and History (2007). "South Slocan Dam". Retrieved 2015-01-07. ^ Waymarking (2013-06-10). "Kootenay Canal Dam - Bonnington Falls, BC". Retrieved 2015-01-07. ^ Touchstone Nelson: Museum of Art and History (2007). "Brilliant Dam". Retrieved 2015-01-07. ^ Virtual Museum Canada (2007). "Aberfeldie Dam". Retrieved 2017-09-22. ^ BC Hydro (2009-06-11). "BC Hydro completes new Aberfeldie Generating Station". Retrieved 2017-09-22. ^ Virtual Museum Canada (2007). "Elko Dam". Retrieved 2017-09-22. ^ "Elko Project Water Use Plan" (PDF). BC Hydro. 2009. Retrieved 2017-09-22. ^ United States Army Corps of Engineers (2013-05-24). "Duncan Dam". Retrieved 2017-09-22. ^ Northwest Hydraulic Consultants (2015-12-06). "Mark Creek Dam(D310002‐00)2015 Dam Safety Review". Retrieved 2017-09-22. ^ National Performance of Dams Program (2016). "Thompson Falls - Intake Dam B". Retrieved 2016-03-13. ^ a b National Performance of Dams Program (2016). "Thompson Falls - Intake Dam A". Retrieved 2016-03-13. ^ National Performance of Dams Program (2016). "Thompson Falls - Dry Channel Dam". Retrieved 2016-03-13. ^ National Performance of Dams Program (2016). "Thompson Falls - Main Channel Dam". Retrieved 2016-03-13. ^ Northwestern Energy (October 2014). "Once-in-a-Lifetime Opportunity for Montana: PPL Hydro Acquisition" (PDF). Retrieved 2016-03-13. ^ a b c d e f Kalispel Natural Resource Department (2014-03-09). "Yes, It's Happening…..Fish Passage on 6 Dams in the Pend Oreille & Clark Fork Rivers for Resident Fish" (PDF). Retrieved 2015-01-09. ^ Avista Corporation (2007-10-31). "Application of Avista Corp" (PDF). Retrieved 2015-01-09. ^ Montana Department of Fish, Wildlife and Parks (April 1985). "Wildlife and Wildlife Habitat Mitigation Plan for the Nixon Rapids and Cabinet Gorge Hydroelectric Projects". Retrieved 2015-01-09. ^ Idaho Public Television. "Cabinet Gorge Dam". Archived from the original on 2016-05-19. Retrieved 2015-01-09. ^ a b The Office of the Governor (2012-11-12). "60th Anniversary of Cabinet Gorge Dam" (PDF). Retrieved 2015-01-09. ^ United States Army Corps of Engineers (October 2011). "Albeni Falls Dam Flexible Winter Power Operations Bonner County, Idaho" (PDF). Retrieved 2015-01-09. ^ Pend Oreille Public Utility District. "Box Canyon Hydro". Retrieved 2016-03-13. ^ Foundation for Water & Energy Education. "Box Canyon: Pend Oreille River, WA". Retrieved 2015-01-09. ^ a b c d United States Corps of Engineers North Pacific Division (November 1995). "Columbia River System Operation Review: Final Environmental Impact Statement" (PDF). Retrieved 2015-01-09. ^ Touchstones Nelson: Museum of Art and History (2007). "Seven Mile Dam". Retrieved 2015-01-09. ^ "Quick Facts For the Year Ended March 31, 2017" (PDF). BC Hydro. Retrieved 29 April 2018. ^ "Waneta Expansion Generating Station | Columbia Power". columbiapower.org. Retrieved 29 April 2018. ^ United States Bureau of Reclamation (2013-10-13). "Hungry Horse Dam". Retrieved 2015-01-09. ^ United States Bureau of Reclamation (2013-10-21). "Hungry Horse Powerplant". Archived from the original on 2014-11-29. Retrieved 2015-01-09. ^ a b c United States Corps of Engineers North Pacific Division (November 1995). "Columbia River System Operation Review: Final Environmental Impact Statement" (PDF). Retrieved 2015-01-09. ^ High Country News (2013-11-25). "Montana Tribes will be First to own a Hydroelectric Dam". Retrieved 2015-01-09. ^ Confederated Salish and Kootenai Tribes of the Flathead Nation. "Acquisition of Kerr Dam & Establishment of Wholesale Power Generation Corporation" (PDF). Retrieved 2015-01-09. ^ a b c d United States Bureau of Reclamation (2013-01-03). "Deschutes Project". Retrieved 2016-03-01. ^ a b c Low Impact Hydropower Institute (2016-10-01). "LIHI Certificate #25 – Pelton Round Butte Project, Oregon". Retrieved 2016-03-01. ^ National Performance of Dams Program. "Round Butte Dam". Retrieved 2016-03-01. ^ National Performance of Dams Program. "Pelton Dam". Retrieved 2016-03-01. ^ a b c d e f g h i j k l m United States Bureau of Reclamation (2013-01-03). "Yakima Project". Retrieved 2015-01-10. ^ a b c d e f g h Oregon Public Broadcasting (2011-09-13). "As dams come down, a new look at hydropower". Retrieved 2015-01-10. ^ United States Bureau of Reclamation (2009-03-27). "Easton Diversion Dam - Dimensions". Retrieved 2015-01-10. ^ United States Bureau of Reclamation (2009-03-27). "Easton Diversion Dam - General". Retrieved 2015-01-10. ^ United States Bureau of Reclamation (2012-07-09). "Roza Diversion Dam - Dimensions". Retrieved 2015-01-10. ^ United States Bureau of Reclamation (2012-07-09). "Roza Diversion Dam - General". Retrieved 2015-01-10. ^ Department of Ecology (June 1991). "Wapato Dam Hydrologic Analysis" (PDF). Retrieved 2015-01-10. ^ Sunnyside Valley Irrigation District. "Facts and Figures: Sunnyside Division" (PDF). Retrieved 2015-01-10. ^ a b U.S. Fish and Wildlife Service (2012). "Passage of Radio-Tagged Adult Pacific Lamprey at Yakima River Diversion Dams" (PDF). Retrieved 2015-01-10. ^ Gabriela Goldfarb Consulting (2008-02-14). "Final Application Reviewer Report for the Willamette Falls Hydroelectric Project" (PDF). Retrieved 2015-01-11. ^ Low Impact Hydropower Institute. "LIHI Certificate #33 – Willamette Falls Hydroelectric Project, Oregon". Retrieved 2015-01-11. ^ a b United States Army Corps of Engineers (2009). "Detroit Lake and Big Cliff Lake, Oregon" (PDF). Retrieved 2016-03-03. ^ a b United States Army Corps of Engineers (2009). "Green Peter Lake and Foster Lake, Oregon" (PDF). Retrieved 2016-03-03. ^ a b c United States Army Corps of Engineers (2009). "Hills Creek Lake, Oregon" (PDF). Retrieved 2015-01-11. ^ a b c d e f United States Army Corps of Engineers (2009). "Lookout Point Lake and Dexter Lake, Oregon" (PDF). Retrieved 2015-01-11. ^ United States Army Corps of Engineers (2009). "Fall Creek Lake, Oregon" (PDF). Retrieved 2016-03-03. ^ National Performance of Dams Program. "Carmen Diversion". Retrieved 2016-03-03. ^ a b c Eugene Water & Electric Board. "Map of the Project". Retrieved 2016-03-03. ^ a b c Eugene Water & Electric Board. "Carmen-Smith Hydroelectric Project". Retrieved 2016-03-03. ^ National Performance of Dams Program. "Trail Bridge". Retrieved 2016-03-03. ^ a b National Performance of Dams Program. "Smith". Retrieved 2016-03-03. ^ a b United States Army Corps of Engineers (2009). "Blue River Lake and Cougar Lake, Oregon" (PDF). Retrieved 2016-03-03. ^ a b National Performance of Dams Program. "Leaburg". Retrieved 2016-03-03. ^ a b c d Eugene Water & Electric Board. "Leaburg-Walterville Hydroelectric Project". Retrieved 2015-01-11. ^ a b National Performance of Dams Program. "Walterville Forebay". Retrieved 2016-03-03. ^ a b c d United States Army Corps of Engineers (2009). "Cottage Grove Lake and Dorena Lake, Oregon" (PDF). Retrieved 2015-01-11. ^ HTE Engineering (2014). "Dorena Lake Dam Hydroelectric Project". Retrieved 2016-03-03. ^ a b c Avista. "Post Falls Hydroelectric Development". Retrieved 2015-01-11. ^ a b Spokane Public Works and Utilities. "Upriver Dam". Archived from the original on 2014-03-19. Retrieved 2015-01-11. ^ a b c Avista. "Upper Falls Hydroelectric Development". Retrieved 2015-01-11. ^ a b c Avista. "Monroe Street Hydroelectrical Development". Retrieved 2015-01-11. ^ a b c Avista. "Nine Mile Hydroelectric Development". Retrieved 2015-01-11. ^ a b c Avista. "Long Lake Hydroelectric Development". Retrieved 2015-01-11. ^ Avista Corporation (July 2005). "Spokane River Hydroelectric Project" (PDF). Retrieved 2015-01-11. ^ Avista. "Little Falls Discharge". Retrieved 2015-01-11. ^ Northwest Council (2008-10-31). "Spokane River". Retrieved 2015-01-11. ^ Lewis County PUD (2013). "Cowlitz Falls Project". Retrieved 2015-01-11. ^ a b Moody’s Investor Service (2013-05-30). "Moody's assigns Aa1 rating to BPA backed Cowlitz Falls Hydro debt" (PDF). Retrieved 2015-01-11. ^ a b c Tacoma Public Utilities. "Mossyrock Dam". Retrieved 2015-01-11. ^ a b c Tacoma Public Utilities. "Mayfield Dam". Retrieved 2015-01-11. ^ a b c d PacifiCorp (2016). "Lewis River". Retrieved 2016-03-03. ^ National Performance of Dams Program (2016). "Swift No. 1". Retrieved 2016-03-03. ^ a b c National Performance of Dams Program (2016). "Swift No. 2 Hydroelectric Project". Retrieved 2016-03-03. ^ National Performance of Dams Program (2016). "Yale". Retrieved 2016-03-03. ^ National Performance of Dams Program (2016). "Merwin". Archived from the original on 2016-03-07. Retrieved 2016-03-03. ^ BC Hydro (2005-07-15). "Spillimacheen Project Water Use Plan" (PDF). Retrieved 2017-09-22. ^ Virtual Museum Canada (2007). "Spillimacheen Dam". Retrieved 2017-09-22. ^ Washington State Department of Transportation (May 2008). "Preliminary Tumwater Canyon Reach Analysis of Wenatchee River and US2, Milepost 94 to 98" (PDF). Retrieved 2016-03-03. ^ a b c Hydropower Reform Coalition (2009). "Hydropower Reform Coalition Success Story" (PDF). Retrieved 2015-01-12. Erik Robinson (April 15, 2007). "Pressure builds on Snake River dams". The Columbian. This page was last edited on 27 March 2019, at 09:08 (UTC).